Russ Cole of Picton, seen here holding his trophy of a life time. Russ and his son Warren show the difference of size by holding up a 15 pounder for comparison. Editor=s Note- Every once in a while Quinte coughs up a real lunker and not just walleye. 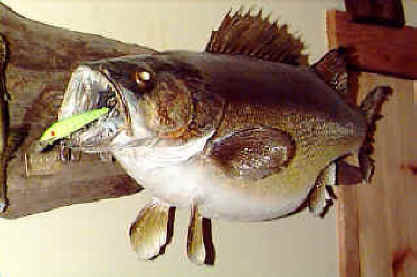 Quinte is home to dozens of species; smallmouth, largemouth, carp, pike, perch and whitefish just to name a few. If you or someone you know has caught a real Quinte lunker and the details can be confirmed please e-mail us at lunker@quintefishing.com as we=d like to share your story here. For the kickoff of this column, there can be no other fish more symbolic of Quinte than the walleye and in particular the one Russ Cole of Picton caught. It was December 23,1996 and the skim of ice covering Picton Harbour from the previous day had disappeared so Russ decided to go fishing. After dinner he loaded up the 12ft. aluminum boat equipped with an electric trolling motor, threw in his tackle box, rod and net then headed off to the launch at the harbor. When I asked Russ what the weather was like that night he said AI don=t remember and I didn=t care anyway cause right off I started catching fish@. In fact Russ tells me he ended up catching 47 fish that night most weighing between 5-12 pounds. Obviously a good night by anyone=s standards. Of all the fish he caught that night two stand out in his memory. The lunker of the night and the bigger one that got away as Russ explains. AI was trolling past the Yacht club in the harbour when my rod tip tapped a couple of times then bent back solid. So when I set the hook I could feel right off this was a big fish. I fought it all the way up to the boat and then I saw the size of it ... it was just huge, no other way to say it. I grabbed the net but the fish was so big I was having trouble holding onto the rod and getting it to fit in and then I lost it. My net wasn=t big enough." After a few moments, when the initial shock and disappointment wore off, Russ settled back to try again. He tossed out his lure and started trolling. Russ caught more fish but none nearly as big. By now he was on the same pass as earlier when again the Atap tap@ at the rod. Russ knew it was another really big one and wasn=t going to take any chances this time, so he called out to another boat and asked the guy sitting in it if he wouldn=t mind coming over to him and giving him a hand with the net. Lucky for Russ the guy turned out to be a charter captain from Lake Erie and had lots of experience with netting fish. He came over and, with a scoop of the net, Russ had the fish in the boat. Both of them realized right off that this fish was an incredible trophy. But Russ didn=t realize how big because he said to me "All I could think about was the one that got away cause it was bigger." The captain told Russ he had some tournament scales in his vehicle and would like to weigh it. Russ agreed and they headed to the dock, back at the launch. With digital scales in hand they weighed the fish and watched the numbers roll. The first digit was a 2, the second was a 0 and after the decimal Russ says A the numbers were bouncing between 6and 8". What a fish! When Russ=s friend and OPP Constable Bob Chapman saw the fish he asked if he could take it over to a butcher friend and have it weighed on proper scales, which he did. Bob took it over to Superior Meats in Picton and the official weight was 20.7 pounds. Before visiting Russ to do this story I called the MNR and asked if there was any way an approximate age could be determined but since the fish had already been mounted it was too late. The most accurate way is through examining the middle ear bones. Interesting note to my conversation with the MNR.. I asked how common a 20 plus walleye was and obviously not very but I was told there are still a lot of the 1978 year class fish (the year class that made Quinte famous) out there. With each year they grow bigger so does a chance of Quinte breaking a record. 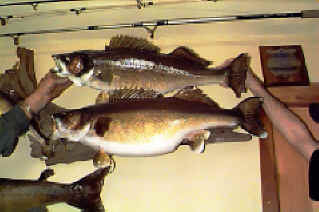 Russ=s fish at 20.7 pounds was very close to the OFAH >s AOntario Record Fish Registry@ walleye at 22.25 pounds. Congratulations Russ on a great fish ! What more is there to say !